Landscape architects provide sustainable solutions, support active lifestyle, design transportation solutions, assist in historic preservation and manage water resources. We help families, communities and businesses address important local, regional and national priorities. Landscape architecture combines art and environmental sciences. Landscape architects design exterior spaces and places. Those less familiar with landscape architecture tend to think of the profession in relatively basic terms, involving plantings around a building or in a park, for example. The reality is quite different; the profession is much broader, richer, and far-reaching. Landscape architects design at many scales, ranging from a tiny roof deck terrace to thousands of acres of National Forest lands; from the private realm of corporate office courtyard to the public realm of a neighborhood park or community plan; from the specialized creation of a healing garden at a hospital to a customized rehabilitation of a native wetlands. The numerous project types, practice types, along with the professional possibilities available to someone with a background in landscape architecture is almost unlimited. 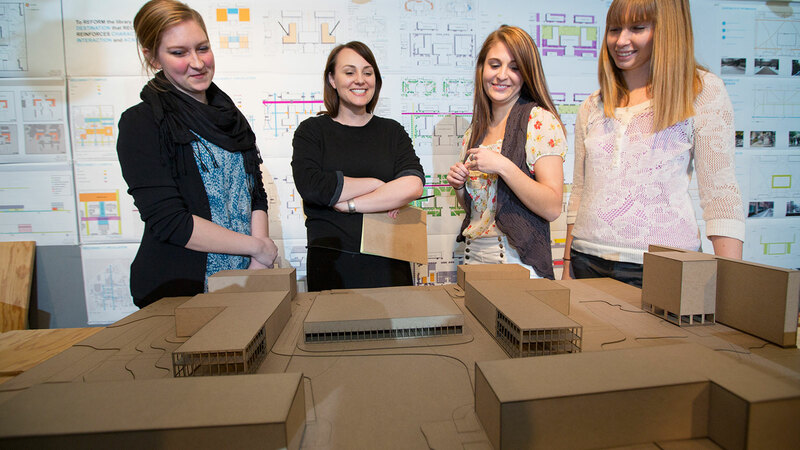 The four-year undergraduate program consists of a common first year of courses shared by students in architecture, interior design, and landscape architecture. This year is followed by two years where students develop discipline-based knowledge and skills focused on site and building, community planning and design, and urban environments. The final year allows for collaborative work with students in architecture, interior design, and planning in research-based studios. Students participate in exploring a broad range of design problems in the studios where they develop design solutions that are presented to practicing professionals and for some projects, actual clients or partners. Students participate in a myriad of opportunities to support learning in the profession including professional electives, seminars, minors, lecture series, and study abroad. Learning about the profession continues in the required internship program where students work in professional design firms for academic credit. The Bachelor of Landscape Architecture degree requires 120-semester credit hours of coursework. The Bachelor of Landscape Architecture program is committed to the transformative power of design. The faculty and students come together in a creative environment combining studio-based teaching and learning, innovative research and creative activity, and community focused service and engagement to enable faculty and graduates to address the synthesis of environmental systems and human need with innovative, collaborative, and interdisciplinary action.